This was a messy, Saturday morning (still in PJs) craftivity in the kitchen kind of a project! E has a book called, "Make It!" that she saw this project in and begged me to let them do it. whatever she wants to do and then they gang up on me. it would be a good lesson for them on how to make paper. First, they picked some papers from the art studio stash to shred. They included a bit of junk mail and some (clean) cupcake wrappers too. we all had sore fingers after shredding the paper. Shredded paper in the bowls. After you soak the paper in hot water, you'll need to drain it. E's book "Make It!" by Jane Bull that we used for this project. when I read the recipe in the book! 1 cup of flour plus 3 cups of water. Put one cup of flour and one cup of water in a sauce pan. Stir with a wooden spoon until the mixture is smooth. to a boil on the cooktop, stirring constantly. Once it comes to a boil, remove from heat and pour into a bowl to cool. The girls "greasing their bowls" with Vaseline. so we don't have to clean off the vaseline when we're done. 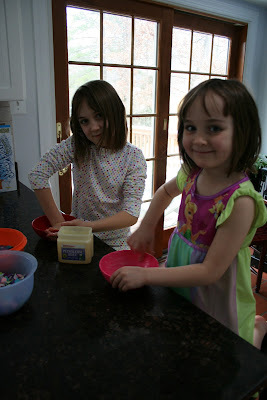 Use lots of vaseline - we learned this the hard way too. E's paper bowl ripped at the end because her plastic bowl didn't have enough grease. with our homemade flour and water "Eco Paste." This project is not for the mess-phobic! Paper bowls drying in the art studio. try almost a week....they took FOREVER to dry out. vaseline on her bowl so hers ripped as we cut it out of the form. "C"s bowl came out perfectly. but at least it was back in once piece! * A Real Life Valentine's Day Love Story.